Amu meets a super-peppy transfer student at Seiyo Academy Elementary School named Hiiragi Rikka at school one day. Not only can she see Guardian Characters, but it seems she has some other, mysterious powers as well. When she sees the work that Amu and the other Guardians do at school, she's awestruck. Each 24-25 minute episode consists of a series of variety show style shorts (including Shugo Chara! Pucchi Puchi) totaling approx. 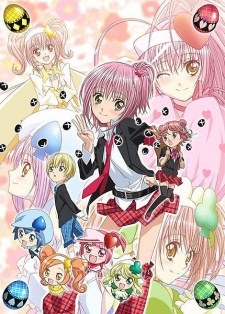 9-10 minutes, followed by the main 11-12 minute animation titled Shugo Chara!!! Dokki Doki which is the actual continuation of season 2 and comes with it's own opening animation. The remaining time is occupied by live action padding between each section and capped off with the opening/ending themes at the beginning and end of the episode.